Close one eye, extend your arm in front of you, and point at an object across the room. Now open that eye and close the other. The objects in the background will appear to jump. You have just demonstrated the effect of parallax, the apparent shift in position of an otherwise stationary object (your pointing finger) with respect to distant objects (the rest of the room) when you change your point of view. It is easier to see the effect of parallax the closer the foreground object is to you. This morning, asteroid 4179 Toutatis was so close to Earth that simultaneous observations from two telescopes in the same country could show parallax that is obvious even to the least experienced observer. The two telescopes belong to The European Southern Observatory and are located at La Silla and Paranal in Chile, which are separated by about five degrees on the globe (or 560 kilometers or 350 miles). The asteroid's apparent position relative to the background stars shifted so much between the two views because it was passing very close to the Earth at the time. 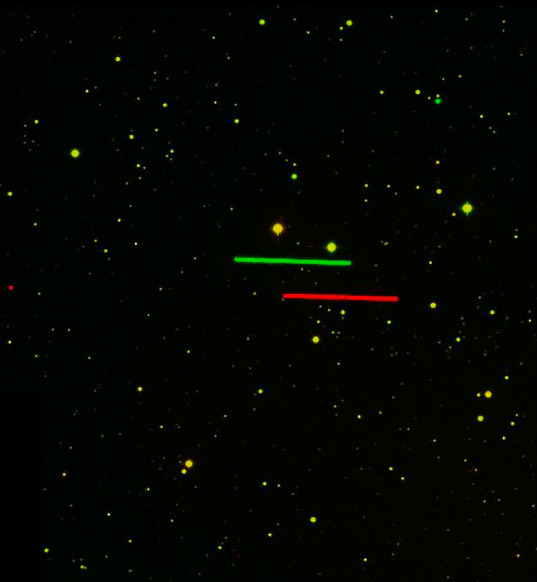 Two images of asteroid 4179 taken on September 29, 2004, at 02:30 UTC, when the asteroid was passing through the constellation of Triangulum Australe (the Southern Triangle) have been superimposed. The images were taken from two sites, La Silla and Paranal, demonstrating the effect of parallax. In fact, the two images can be used to determine very accurately the distance to Toutatis. The distance between La Silla and Paranal forms the base of a triangle, and the two images provide extremely precise information on the angle from the two observatories to the asteroid. This simple geometry problem yields a distance to Toutatis of 1,607,900 kilometers (999,100 miles) at the time of the observation. According to the European Southern Observatory, this distance is "Very close" to the predictions. "This exceptional, simultaneous set of observations thus provides an independent measurement of Toutatis' distance in space and, like the measured positions, a confirmation of its computed orbit." At its closest, Toutatis passed within 1,550,000 kilometers (963,000 miles) of the Earth. Toutatis travels on an orbit that brings it relatively close to the Earth once every four years. According to the current best estimates, today's will be the closest pass at least until the year 2562. Observations performed this month by the European Southern Observatory and myriad other telescopes as Toutatis buzzes by the Earth will help to refine the notoriously tricky orbital calculations, and help to determine whether Toutatis is a menace or merely a curiosity.